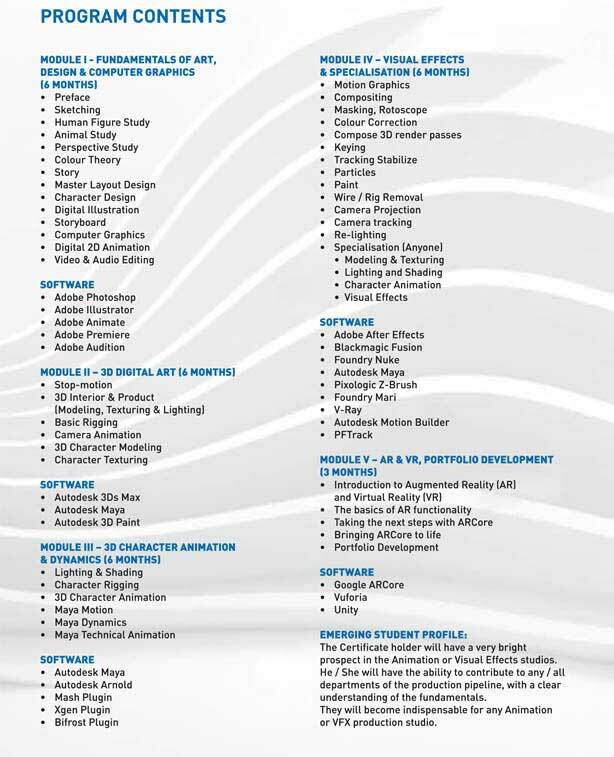 The DEGREE holder will have a very bright prospect in the Animation or Visual Effects studios. He / She will have the ability to contribute to any / all departments of the production pipeline, with a clear understanding of the fundamentals. They will become indispensable for any Animation or VFX production studio. Admission to the institute would be based on the student’s performance in the creativity test and must have passed in 12th board exams in any stream. The DEGREE holder will have a complete understanding of the different modules of VFX, which will help in attaining a bright career. The VFX certificate holder will be capable of delivering outstanding VFX shots due to his / her extensive knowledge in areas like Live Action shooting, 3D Animation, Advanced Dynamics, Tracking & Compositing etc. The Dipolma holder will have a very bright prospect in the Animation or Visual Effects studios. He / She will have the ability to contribute to any / all departments of the production pipeline, with a clear understanding of the fundamentals. They will become indispensable for any Animation or VFX production studio. The Diploma holder will have a complete understanding of the different modules of VFX, which will help in attaining a bright career. The VFX certificate holder will be capable of delivering outstanding VFX shots due to his / her extensive knowledge in areas like Live Action shooting, 3D Animation, Advanced Dynamics, Tracking & Compositing etc. This Program covers a wide variety of tools delivered in a systematic manner so that the student enjoys every moment of learning. The student will be exposed to Graphic design, Architectural Visualization, 3d Animation, Visual Effects. Fashion designers must study their craft well in order to be successful. A fashion design course can provide the introduction to further study in this high demand field. A fashion design course is a course that covers the art of designing beautiful clothing and fashion accessories. The student shall be well versed in 3D Content Development in any 3D production studio. 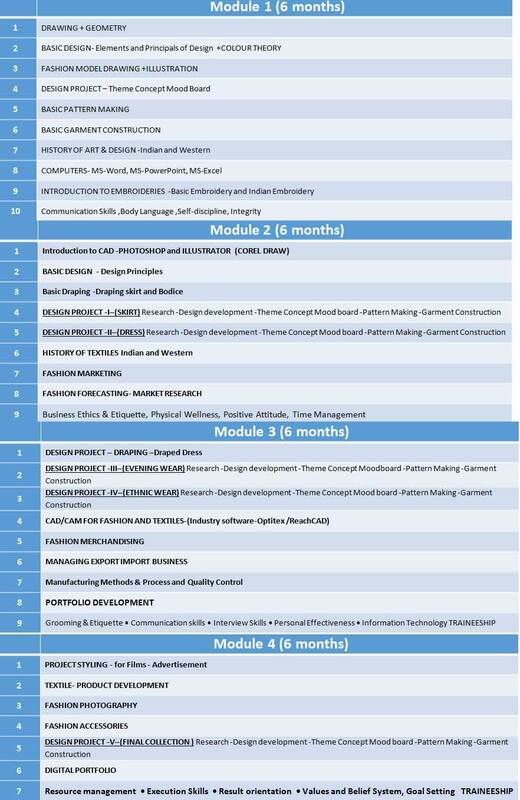 The USP of the program is its elective specialization in any one 3D module. This will help the student to build a career in 3D Animation within a short span of time. The student will acquire skills that are needed to excel in any Visual Effects Studio as a Compositing Artist. Good understanding of Design, aesthetics of filmmaking along with strong fundamentals of Visual Effects will make this candidate, an advantage for any VFX team. Many of Graphic Designers are employed in specialized design services, publishing or advertising, public relations, and related service industries. Majority of them become self-employed or freelancers due of the rising demand for quality designers. UI & UX designer is responsible for understanding both customer problems and business goals, crafting testable hypotheses, designing the solution and then vetting the solution with customers.” The UI & UX Designer must wear multiple hats; empathizing with users, understanding the system they are working with, and solving problems. The world job market for UI / UX designers is increasing at a tremendous rate. This Program is a Combination of Program in Graphics Design & Program in Web Design. the emerging student will gain complete understanding of Designing a Website independently. The importance of 'Digital Design' in Marketing cannot be stressed enough. Today each and every prouct/service being promoted via Digital Markeing incorporates the concept of relevant visual elements to appease the target audience. It is one of the most critical and fundamental factors affecting the success of a Digital Marketing campaign. So Professional Program n Digital Design and Marketing combines both the world together to bring out more successful Digital marketing expert. The second module 'Digital Marketing'covers a wide range of marketing activities. This program deals with types of digital marketing , important technologies, web advertising and fundamental components, Google Adwords, account setup, SEM in modern business, Display Advertising, E-mail Marketing, Mobile Marketing, Social Media Startegy, Google Analytics etc. Interior design course is a well-rounded education and the skills to work in many disciplines such as architecture, graphic design, decorative arts, and textile, furniture, and lighting design. Our students will have knowledge of textiles, materials, colour, space planning, sustainability, and more. They will also be well educated on the software applications for 2D & 3D computer-aided design (CAD) and building information modelling (BIM). A student can deal with structural requirements, health and safety issues, and building codes. Increase design and visualization skills Learn complete interior design production pipeline Continuous evaluation through examination, competitions and activities Regular onsite visit for site and meeting with professionals on site. A career in multimedia involves graphic design, audio, digital, print and video production. Video editors, web designers, and illustrators all work in the multimedia field. Although entry-level jobs can be obtained easily, most multimedia careers involve graphic design, web design, architectural walk-through, audio and video editing. 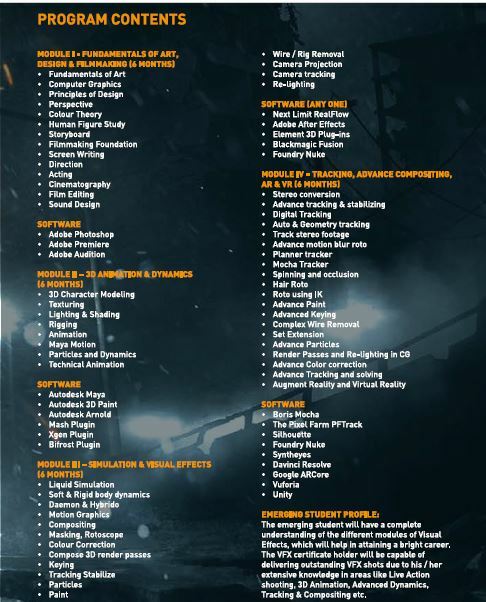 There are enormous job opportunities at the entry-level of the Compositing Department make this program very lucrative. He / She will acquire the skills needed to enter a Visual Effects Studio as a Compositing Trainee. Candidates can build the career while working and gaining experience at production studios. Students will have the requisite skills to digitally compile artworks for illustrations, advertisements, photography, image editing, Press Ads, Magazine Artwork, Promotional Displays etc. He / She will also have the basic understanding of Design & Composition, hence delivering good results. The emerging student will gain a complete understanding of website design. He / She will be capable designing websites independently. The course completed student can create strategic plans, develop business cases and formulate the digital marketing strategies for any client. They can be part of any existing strong digital marketing team or individually work comfortably with deep domain understanding in digital marketing, social media and brand management. He or she can develop digital marketing solution strategy spanning across Web Analytics, SEM, SEO, Display, Affiliate networks, Social media marketing and site experience optimization. The emerging student will create permanent visual images for an exceptional range of creative, technical and documentary purposes. A large proportion of our students will be self-employed or enjoy it as a hobby. The remainder work for a variety of employers, including creative businesses, publishers and photographic agencies, or in the education and public sectors. Zee Institute of Creative Art (ZICA) is the india’s first full-fledged Classical and Digital Animation Training Academy that trains youth in classical 2D and modern 3D animation.